Kombiner besøg på Chengdu Tianfu Square, Leshan Giant Buddha og Chengdu Panda Breeding Base i en heldagstur fra Chengdu. Pickup og drop-off på udvalgte Chengdu hoteller inkluderet. Vær klar klar og tidligt til afhentning på dit Chengdu hotel mellem kl. 7.20 og 7:40. Bestyr en klimatiseret tour coach bundet til den berømte Chengdu Research Base of the Giant Panda. Tilbring flere timer ved basen om at lære om medarbejdernes opdræt og bevaringsindsats. Besøg forskningslaboratoriet, museet, panda legepladsen, dyrehospitalet og anlæggets smukke sø. Afrejse omkring kl 11 for turens næste stop, Leshan Giant Buddha. Ankomme på verdens største sten Buddha omkring frokosttid, og straks tage en pause til frokost. Din guide vil gerne anbefale nogle restauranter i området (egen regning). Statuen, der stammer fra Tang-dynastiet, har udsigt til sammenflugningen mellem Qingyi, Dadu og Minjiang-floderne og er opført som UNESCOs verdensarvssted. Vandre de omkringliggende stier, der overser Mount Emei, snapper billeder og får en spektakulær udsigt. Gå tilbage til Chendgu omkring kl. 18.30 for aflevering på Tianfu Square. Tilføj en valgfri aftenaktivitet af en Sichuan Opera på et traditionelt tehus. Our guide Bella was really good. Bella had a lot of information about Chengdu, the pandas and Giant Buddha. We were given plenty of time to photograph the pandas. At the same time, Bella did a good job at keeping our group together. We were a small group of 7 people. Privéchauffeur Engels sprekende privé gids. Door de verkeersdrukte kwam de chauffeur bijna één uur te laat. De gids was wel op tijd. Gelukkig nog wel net op tijd voor het voeren van de Panda's. Goede gids, mooi park en een prachtig uitzicht vanaf de boot op de Giant Buddha. Zeker de moeite waard!! The tour was very well organised, timing was perfect to enjoy both the panda base and the giant Buddha although panda lovers might want to stay at the base the whole day, but then it's not possible to combine a second attraction. The giant Buddha is a couple of hours drive from the panda base. Our tour guide Summer was extremely professional, very nice and spoke a perfect English. 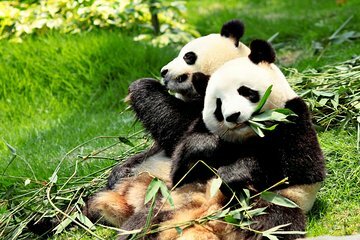 We recommend it if you can't spend much time in Chengdu, as it allows you to enjoy two of the most popular attractions in the area. If there was an option to give this tour zero stars that's what it would get. It is a mistake and waste of your time and money, and I will tell you why. First of all, please note that they sell the tour like "board an air-conditioned tour coach" and that you will have a guide. well, these 2 things are not 100% accurate amongst other ones. Please read the list below of some of the reasons why you shouldn't book this tour even if its going to the 2 places you want to go and has a reasonable price. 1. The guide was 25 minutes late in our morning pick-up and didn't even consider calling us to let us know. 2. The promised coach was a JAC mini van that the leg room was half that of a spirit airlines seat, please note you will be there for more than 5 hours in total, you will be miserable in those cramped seats. 3. The promised air conditioned wasn't turned on until I requested it, the driver would then turn it on for 5 minutes and then back off. This happened more than 5 times. We started to get upset and kept requesting it, he basically told us to shut up, that he got cold in the arms, so basically no customer service. 4. During the first 45 minutes of the ride to the buddha the guide was talking very loudly with the driver, almost like shouting. All the bus was trying to sleep and it was impossible due to the guides disrespect, we then had to ask him to please be quiet. 6. The driver had no driving abilities. I'm actually glad I'm here today writing this review. He was passing cars where it was not allowed and hitting the brakes in an unsafe way. 7. The guide wasn't really a guide, he was more like a companion that was very very hard to understand, and barely gave any relevant information. Overall I am very disappointed that a company like Viator sells such a mediocre and misleading tour. Even though I'm aware the tour operator is not Viator you would except they do their due diligence in offering the best, safest and most fulfilling tours. Please note that this is only one of my first reviews and i will make sure that any other tourist that has the intention of booking this tour is aware of what they will be getting. Keep in mind that these are only a few reasons of why you shouldn't book it. Amazing Tour. Loved the pandas, the buddah was just wonderfull und the evening show was a good finish of a great day. The tour guide was probably the best chinese tour guide I ever had. 1 Viator claims to have reviewed and hand picked every tour operator. In this case it was obvious that the China tour operator had subcontracted to a regional tour operator who had either further subcontracted to a local and/or then subcontracted to a freelance tour guide and tour bus driver - both terms here used very very loosely. What a disappointment. Neither had ever worked with the other and the bus driver kept getting lost. It took us over 1.5 hours just to pick up the group of 10 because the two kept getting lost. 2 Viator is very lucky there was not a road accident along the way. The driver broke every law possible - ran red lights, speeding, reckless driving, driving on the wrong side of the road, mid- road U-turns. At one point we almost got off the bus to try hail a taxi to return back to our hotel by ourselves. 3 The guide was hopeless - at both the Panda reserve and Leshan we decided to go off on our own as he was clearly clueless and out of his depth. Our first and last ever tour with Viator. Guide was good, named Jason, caring and attentive. Lushen Giant Buddah was a good tour. I was disappointed with the panda tour which basically was the equivalent of going to the zoo. Tour description was misleading. Tour made us believe you could take a pic with a baby panda for a fee. This is not at all possible in this location. I would not recommend the panda tour. Very enjoyable day with the morning spent at the Panda Breeding Centre with plenty of photo opportunities - a bit of walking involved but opportunites to stop and rest. We even saw the newborn pandas! Afternoon also good seeing the Leshan Buddha. Perhaps lunch could be a bit more streamlined - our guide seemed reluctant to order and as the menu was in Chinese we were lucky we had a Chinese-speaking girl in our group. Maybe just include a selection of dishes to suit everyone - eg. spicy/not too spicy, vegetarian, etc and add the set price onto the tour cost. Also because we were running a bit late we weren't all consulted about the choice of walking up to the Buddha or taking the boat - we were just taken to the boat. Still, a very good day. Disappointed in this tour. First the hotel pick up did go smoothly but it was not in an air conditioned van. In fact this van was in rough shape, AC only turned on when leaving the city and for those of us sitting in the middle and back we got no air. I asked for the driver to make it cooler but nothing worked. This made for a tough day given the heat, humidity and walking that this trip would entail. It would have been nice to be able to ride in a cool vehicle esp because there was a lot of drive time - 45 mins to research center, over 3 hrs to Leshan due to traffic and 2 hrs back. Also, all seats get sold, so two of us had to sit with the wheel well - very uncomfortable given all the time in the car. I was disappointed as well because at Leshan the small group must decide as a whole to either hike or take the boat. The guide definitely swayed the group towards the boat. The boat is 30 mins at best and was not ideal. Since the car ride was so unbearable it was decided to not hike given the heat. So majority had ruled with no hike, but means you miss a lot of the Buddha. I would not reccommend this tour - if doing Leshan do it as a full day and do Pandas an alternate day. The Chengdu panda center is awesome, so worth extra time there too vs being constrained to get to Leshan. both the pandas and the buddha were very special and worth visiting. My guide Joy was lovely, very down to earth. The trip to Leshan is a few hours, so it's a long, tiring day.